I had a fascinating chat with Phil Cullen, the Mountain Man himself who is the really nice guy who started the Mountain Man Brewery in a place that I had never heard of before, Renanirree in Cork. Apparently it is somewhere in the Gaeltacht area with Macroom being the nearest town. I met Phil at the official launch of the spectacular Heather Restaurant at Moriarty’s at the foothills of the Gap of Dunloe. We were privileged to be looking after the PR for the Moriarty’s new venture and Phil was one of the many artisan local producers that feature in the restaurant who were showcasing their wares as part of the event. If you get a chance at all take a spin to this fantastic restaurant in a breathtaking location and enjoy some incredible food. 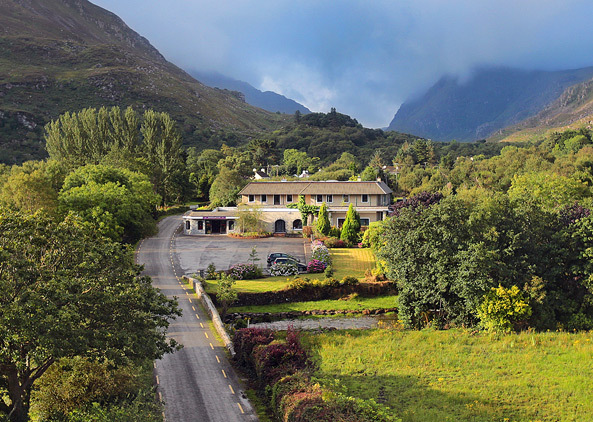 The team of Denis Pio, Ailish and Jennifer have created a real gem in the KIngdom of Kerry. Phil, a civil engineer by profession has followed his passion like so many other craft brewers that seem to be exploding onto the market in Ireland. 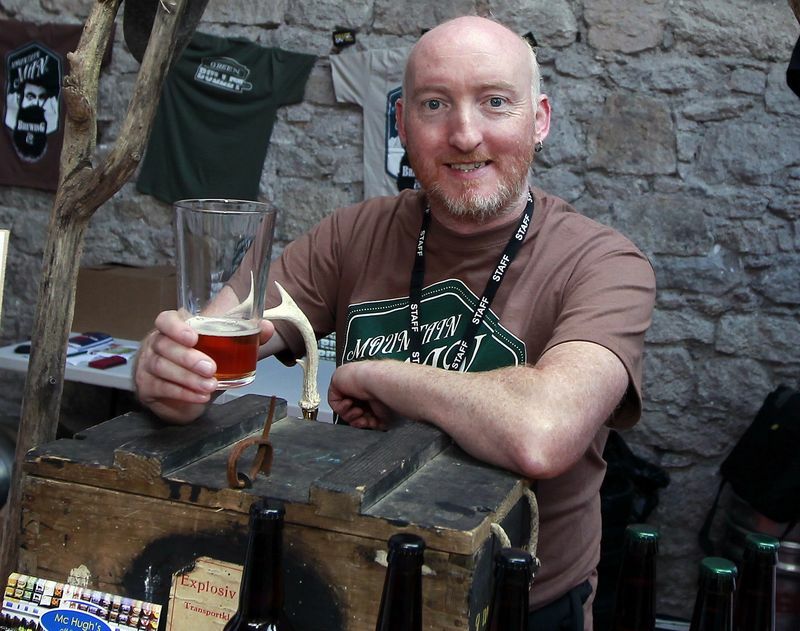 The collapse of the building trade made it easy for this enthusiastic home brewer to make the move and start the business in the Derrynasaggart Mountains in 2012. Phil who had been home brewing for 11 years, saw an explosion of micro-breweries in Canada where he lived for a few years and the return to Celtic Tiger Ireland in 2005 just before the ‘wheels fell off‘ turned out to be perfect timing for him and his new venture. Take one peep at the website for Mountain Man Brewing and it captures both his unique spirit and the spirit of revolution that is starting to take hold in Ireland. We are fed up of the same, we crave things that are not only different but that are genuinely authentic. We want this in our food, we want this in our drink. we want it in our music, we want it where we visit, we want it where we stay, where we eat, where we drink and we want it in our entertainment. I believe there is a huge movement back to things that are real and authentic, which for me is all about appreciating craft and produce that is made with passion but it is also a rejection of all things ‘plastic‘ that poisoned us during the reckless, commercial, greedy and very shallow Celtic Tiger era. We are getting back to so many things that are really important and in many ways rejecting some of the awfulness that was allowed to creep into our Ireland. We can even see this in the latest trends with Irishmen. Phil’s beard might be something you would expect in the hills of Derrynasaggart but now we are seeing this ‘back to nature‘ look on our city streets everywhere! I was telling Phil how a Guinness Sales Director said to me about 20 years ago when I was working there that he was surprised that more was not being made about the ‘Craft of Irish beer‘ at the time. This new director, just in from the UK could not understand how more was not being made of the craft and heritage and was surprised that the Guinness company wasn’t grabbing this more …he was right! While Guinness always explored new products the priority was always the big prize with big volumes of big brands and in some ways less choice may have been an easier option. Phil mentioned that he toured one of the big breweries and he asked the brewmaster some question about alternative brews. He was surprised when the brewmaster replied that brewing this one product was all that he knew. Can you imagine turning up everyday and producing exactly the same thing over and over with no variation to an exact formula, which is the case with most of what we consume. The opposite sounds like heaven where you can experiment with ingredients, try different blends always bringing out something new. Phil quickly reminded me that the skills of that brewmaster are also essential as you do need the guys who understand how to produce quality consistently, which is just as important with craft beers. While we love difference we need it to be reliable! The tagline on Phil’s website perfectly sums up the spirit of Mountain Man, the Moriarty’s, the artisans, and anyone trying something new “Beer for people who colour outside the lines“. Are you colouring outside the lines? This entry was posted on August 9, 2014 at 1:20 pm and is filed under Branding, Entertainment, Hospitality, Ireland, Tourism. You can follow any responses to this entry through the RSS 2.0 feed. You can leave a response, or trackback from your own site.